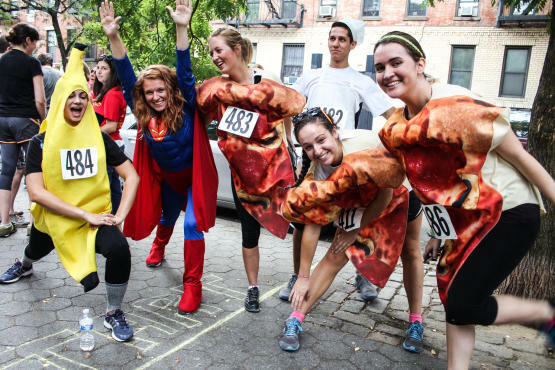 The NYC Pizza Run premise is simple: Chow three slices of pizza while running 2.25 miles through the East Village. Athletes carbo-loaded mid-race at the third annual NYC Pizza Run on Saturday, September 21, stopping to eat three slices of pizza while running 2.25 miles. The aerobic pig-out benefits the Juvenile Diabetes Research Foundation. If you've got a sweet tooth, start training for the NYC Cupcake Run on October 19. What do you think? Tell us below! Subscribe to Time Out New York on Spotify for playlists and recommendations from our Music team. Check out New York's best restaurants, hottest street style, cool apartments and more.